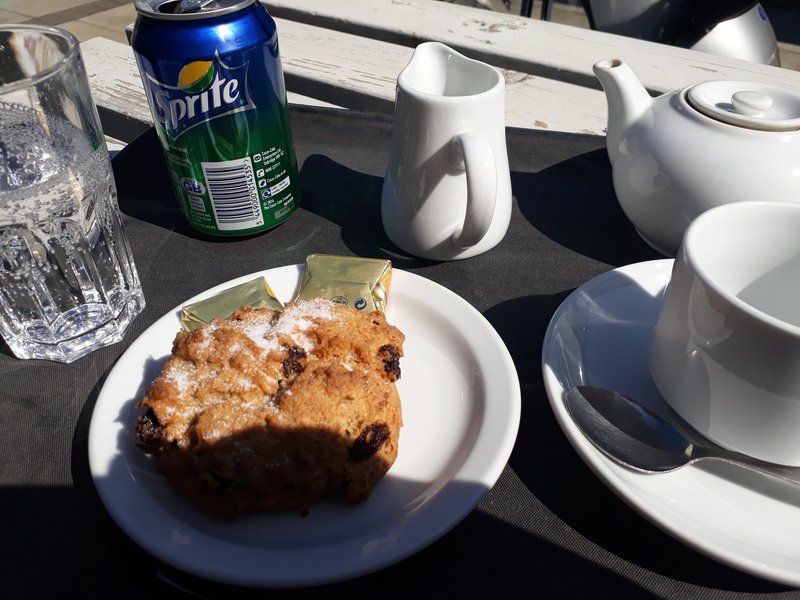 Rock cake, tea and lemonade at Maud. I had high hopes for rest stops today and I was not disappointed. 6 miles to Cuminestown which had public toilets [and I signed the petition to keep them open], an excellent grocery shop and a bench on which to sit while I ate my feast of a sandwich, bag of crisps, cup of tea and a choccy bar. The tea wasn’t the best [I think the machine’s lines were still full of Milton] but it was a treat to rest in the shade while I ate my meal and watched the manure wagons going past. Then there was a 9 mile stretch to Maud which also had a shop but – better than that – had a café which was open until 3:30pm so was still serving when I arrived at 3:15pm. I sat at an outside table, with my shoes off and my feet raised, while I ate my rock bun and drank my tea and lemonade. Then it was just 3 or 4 miles along the Formatine and Buchan Way to Aden Country Park and the campsite. I saw a GoLite rucksack outside the shop so expected to be caught up by another Challenger but nobody appeared either on the old railway track or at the campsite. My last Challenger had been at Tomintoul on the Sunday morning and I would see no others until I reached Montrose on Thursday. This entry was posted in TGO Challenge and tagged Aden Country Park, Cuminestown, Formatine and Buchan Way, Maud, TGOC2018. Bookmark the permalink.